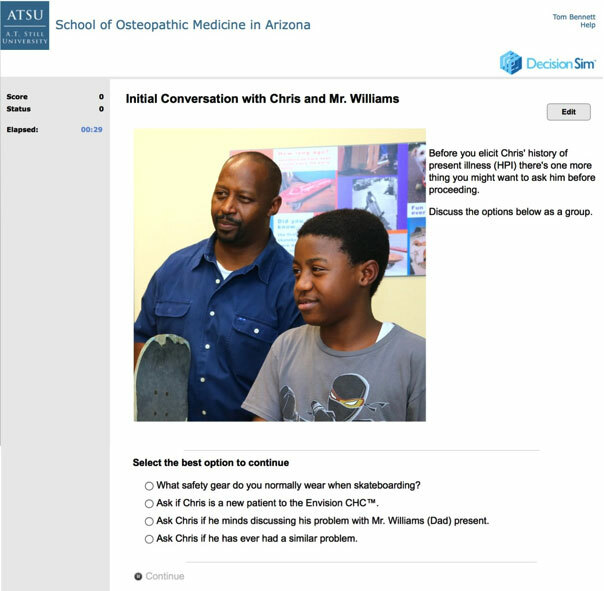 Participants at the Arizona Osteopathic Medical Association (AOMA) Convention in Phoenix, Ariz. collaborated in treating virtual patient Chris Williams, who presented to the Virtual Community Health Center (VCHC) after falling off his skateboard. The VCHC is part of a wider A.T. Still University School of Osteopathic Medicine in Arizona (ATSU-SOMA) initiative to test and implement a curriculum dedicated to teaching medical students to work with vulnerable patient populations with the goal that large numbers of trainees will select a career in primary care or in specialties needed to meet the care requirements of the underserved. Modern medical schools that focus on primary care require new curricula specifically targeted to community-oriented primary care in low income or medically underserved populations, such as social justice, social determinants of health, family-oriented care, cultural competence, longitudinal care, and interprofessional teamwork.